The 7-inch, $49.99 fire is now available to purchase in blue, magenta and tangerine, joining the original black option. As before, it sports a 1.3-gigahertz quad-core processor, rear- and front-facing cameras, and 8 gigabytes of storage with a microSD slot for expansion. All four colors are also available in a larger 16-gigabyte internal capacity for $69.99. As is par for the course with Amazon, the touchscreen tablets come with "special offers" in the form of advertisements that contribute to the bargain pricing. Finally, the Fire Kids Edition has also been expanded to include a green kid-proof case and 16 gigabytes of internal storage for $119.99. Children's models with blue and pink cases are also available in 16-gigabyte capacities for the same price, while the 8-gigabyte model remains available for $99.99. 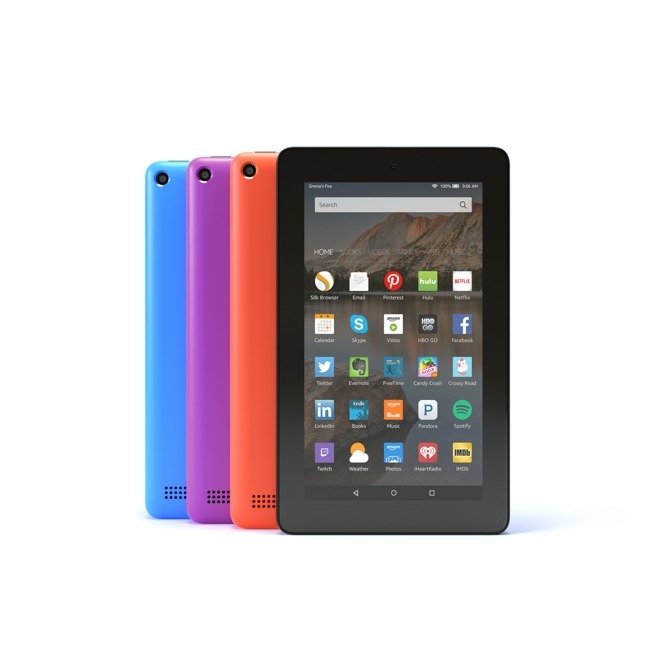 The low-end $50 Fire tablet debuted last September. The online retailer has aggressively targeted cost-minded consumers with low-end devices that devices like Apple's iPad don't reach. Apple, instead, has been pushing even further toward the high end of the tablet market. Its 12.9-inch iPad Pro launched last fall with a starting price of $799, while the 9.7-inch model sells starting at $599— a $100 increase over the historical starting price for a new iPad in that size.